We love to celebrate all special occasions, and we believe the best way to do that is with lush, fragrant, fresh cut blooms from the farm. Let us help you with flowers for your wedding, party, shower, mitzvah, fundraiser or gala. Bluegreen Gardens offers a variety of services for all budgets and events, including full-service design, a la carte and DIY options. We are committed to growing and sourcing the best local, seasonal and sustainable flowers and foliage for your wedding or event. Our floral design style is always garden-inspired and ranges from wild and natural to elegant and romantic. Please explore your options below and then contact us so we can get started designing beautiful, one-of-a-kind flower arrangements for your special day. Full-service floral design includes everything to fulfill your floral dreams. 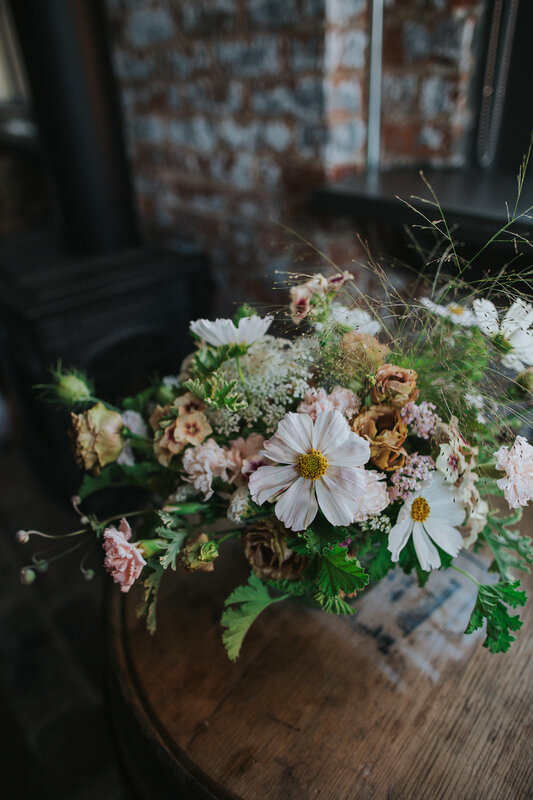 As part of our full service option, Bluegreen Gardens will work with you to craft a floral design plan that includes distinctive details, gorgeous seasonal flowers and special touches that reflect your style and event aesthetic. Our services include a personal consultation and delivery and set up of all your wedding flowers. Please contact us to find out more and set up a consultation. This is our most popular option and offers the most flexibility. Our 'a la carte' option is perfect for those looking for just a few select items for their special day, such as bridal party bouquets and boutonnieres. This package can be combined with our bulk blooms, so that we design key elements while you create others. Please get in touch with about 2 months before your event to order. Throughout the peak of the growing season, June-October, Bluegreen Gardens offers buckets of fresh cut, sustainably grown flowers and foliage for DIY weddings and special events. Each bulk bloom bucket includes about 60-75 stems of coordinating botanicals of different shapes and textures for you to make beautiful arrangements on your own. It is your responsibility to determine the number of stems you may need for your event. Pick up is always available and delivery is available for a fee. Please order at least 10 days before your event.